SCAmp Audio Test Amplifier – Listen, Inc.
SC Amp is the world’s only dedicated audio test amplifier. Specifically designed for the audio test market, it incorporates several features unique to the needs of audio test and measurement, and unnecessary features found in regular audio amplifiers have been eliminated to keep production line operation simple and error-proof. 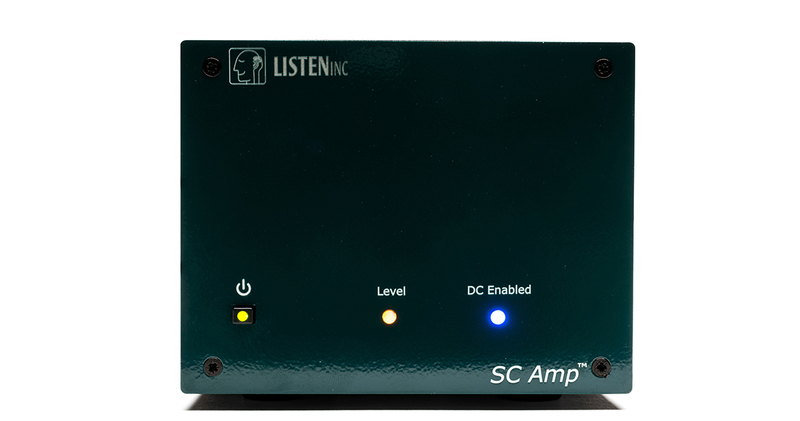 SC Amp is the world’s only dedicated audio test amplifier. Specifically designed for the making audio measurements, it incorporates several features unique to the needs of loudspeaker testing, and unnecessary features found in regular audio amplifiers have been eliminated to keep production line operation simple and error-proof. Rugged and easy to use, SCAmp is a mono amplifier with low distortion (THD <0.025%) and a low noise floor (>100dB). Fixed gain eliminates calibration errors as there is no gain knob to be accidentally knocked or tweaked whenit is in use. It supports the application of a DC voltage offset to the AC signal for testing transducers under adverse conditions. Overload/output protection prevents damage due to shorting or overload. SC Amp’s integrated impedance measurement uses Listen’s unique patented (U.S. Pat. 9,386,387) high accuracy single channel impedance measurement method to offer dual channel accuracy using just a single channel, meaning that full electrical and audio tests can be carried out using just 2 channels. 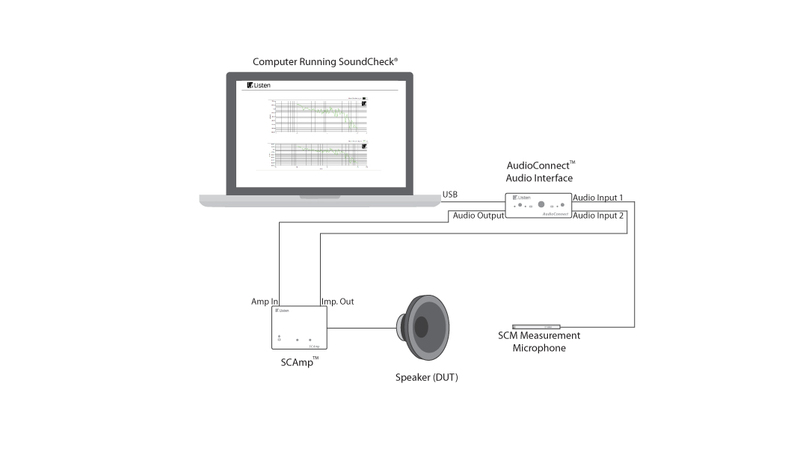 SC Amp integrates seamlessly with Listen’s SoundCheck audio test and measurement software and will also work well with other brands of test system. 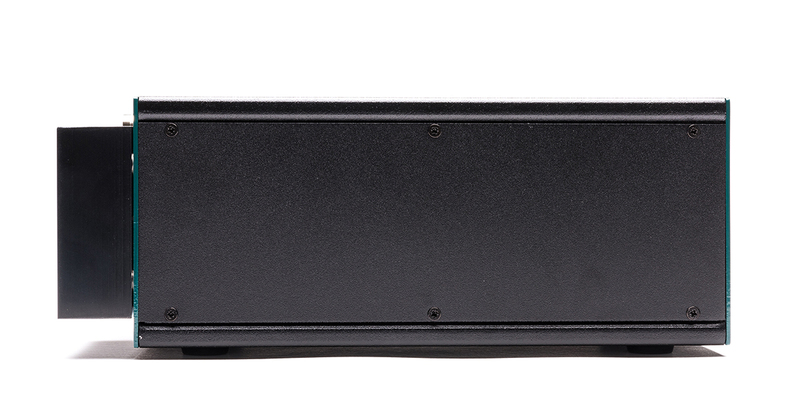 The rugged 2-unit high enclosure can be mounted in a 19” rack. The front panel contains only an on/off switch and LEDs to indicate power on, level, and DC offset. This simple front panel keeps operation easy and error-proof as there is no possibility of knobs or buttons being accidentally changed. The rear panel features a current monitor output for impedance measurement (thus eliminating the need for a separate impedance box), a DC input with on/off switch, and a ground lift to isolate the amplifier from the input signal ground to eliminate ground loops. SC Amp can accept balanced or single ended audio inputs from the audio interface.